As we are in Fall Festival and Thanks Giving season, the Food Magazines and Blog world are full of pumpkin related recipes making it a feast to eyes. 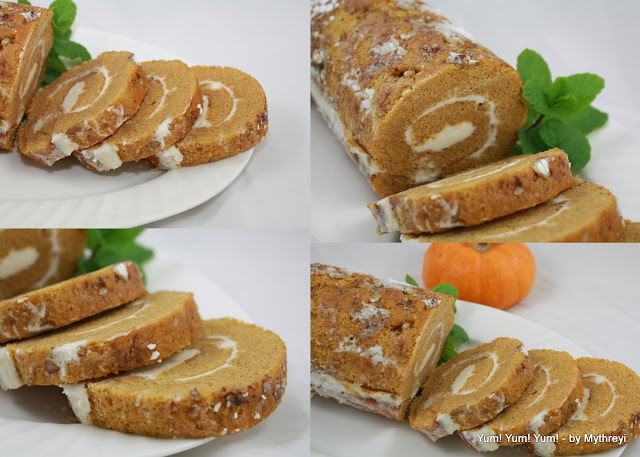 That reminds me that I have never made any pumpkin related recipes so far and today this beautiful Pumpkin Cake Roll recipe caught my eye. As I have never made a cake roll before, this is going to be a baking challenge for me. If it comes good, my sweet lovers in the family will be happy, if not it will be a good experience for me and it keeps some laughs for memories in future. I have adapted this recipe from Libby's recipe, but played with some spice measures in my version here. The preparation of cake roll involves some artful steps like rolling the cake, and unrolling the cake and again rolling it back with filling spread. Oh, Boy! any thing artful means it makes me nervous. After reading the recipe, I have lost good feelings about rolling the cake part. But anyways, went ahead gave it a try. The effort was totally worth it. At the end the Pumpkin Cake Roll came as one piece, looked gorgeous, tasted delicious, leaving an awesome experience. So I have rolled the cake for the first time with no failure and it is not as bad as i thought. Am I ready to make another cake roll? Yes, next time it's going to be chocolaty! :-) Here is my version of Pumpkin Roll Recipe, Njoy! PREHEAT oven to 375° F. Grease 15 x 10-inch jelly-roll pan (I have used cookie sheet with 1/2 inch edge); line with wax paper. Grease and flour paper. Sprinkle a thin, cotton (or paper) kitchen towel with powdered sugar. COMBINE flour, baking powder, baking soda, cinnamon, and salt in small bowl. Beat eggs and granulated sugar in large mixer bowl until thick. Beat in pumpkin. Stir in flour mixture. Spread evenly into prepared pan. Sprinkle with copped walnuts. The recipe called for Jelly Roll Pan, which i don't have, but I have used my cookie sheet ( with 1/2 inch height edge) after looking at the results, i can tell you to confidently use the cookie sheet, if you don't have jelly-roll pan. You can use the fresh pumpkin puree or canned puree. Today in this recipe, I have used the canned one. Very attractive roll, beautiful and neatly done. cake roll looks very tempting and is making me hungry! Your cake roll looks superb.